painting works, repair, restoration and preservation. Your donations and support are greatly appreciated. We thank Capture Marin for giving us permission to link to his YouTube video. In October, 2017 St. Mary’s Church will celebrate the 150th anniversary of its dedication. To ensure that St. Mary’s is looking and feeling its best, the parish is embarking on a fund-raising campaign. Our goal is to raise approximately $170,000 between now and June, 2017. 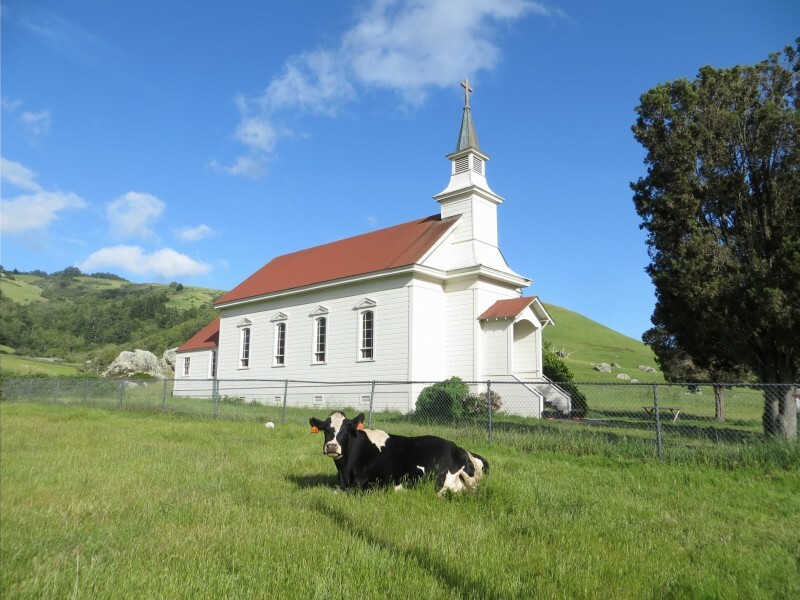 We hope to be able to engage the local Nicasio and West Marin community and foundations in the effort. But, a significant portion of the funding needs to come from our parishioners. Our objective in the first few months of the Capital Campaign is to secure commitments from 100% of the parishioners. Why is 100% participation important? When we approach foundations and the local community, it is essential that they know that we, the parishioners of this church, are fully committed to this work of restoration and renovation. Since its very beginning, St. Mary’s has been built, maintained, restored and preserved by its parishioners. Giving of their Time, Talent and Treasure, generations of people who love this church have made St. Mary’s a wonderful house of worship as well as a historic and cultural icon. It is now our turn to carry forward the loving spirit of personal commitment to St. Mary’s that guided all those many people who came before us and passed St. Mary’s down to us. What can you do to participate in this exciting adventure? Pledge a portion of your Treasure to the Preservation Fund. If every parishioner were to pledge $2000, we would have a substantial start on that goal of $170,000. But, we don’t all have the same financial conditions. What you decide to contribute is up to you. No pledge is too small, and none is too large. All pledges are welcomed. Enclosed is a pledge card which you are asked to fill out and return. You can drop the card in the offering plate, hand it to any of the Capital Committee members listed below, or mail it to St. Mary’s. Please return the card by December 7, 2014, regardless of your planned pledge amount. Check out the back of the pledge card. It has some helpful hints about deciding how much to pledge. Do you want to do more than just pledge money? Mark the card, and we’ll contact you to discuss options and opportunities. Once you have made your pledge, it is important to keep track your progress toward fulfilling your pledge. Whether you are giving weekly, monthly, quarterly or annually, always mark your contribution “St. Mary’s Preservation Fund.” If you are paying by check, write that designation in the memo line of your check. If you are paying cash, please put your donation in one of the small envelopes you will find in the narthex labeled “St. Mary’s Preservation Fund” or an envelope of your own similarly marked. We will keep a record of each donation. At the end of each year, we will provide you a reconciliation of your pledge if you so request. Keep in mind that all your donations to St. Mary’s are tax deductible. So, as you approach the year end, consider your pledge in your tax planning. Finally, please remember, these pledges are not in place of your regular weekly offering. St. Mary’s depends on your weekly offering to sustain itself on a daily basis. Instead, your pledge is in addition to your regular offering. Thanking you for your commitment to St. Mary’s Church, we are your Friends in Christ. To the extent possible, we will incorporate suggestions from the parishioners for additional items to include in the overall project. Click here to download the Information Card [PDF]. P. O. Box 289, Lagunitas, CA 94938. Send us your suggestions or ideas, we love to hear from you. Or, if you would like to know more about our project, please contact us. 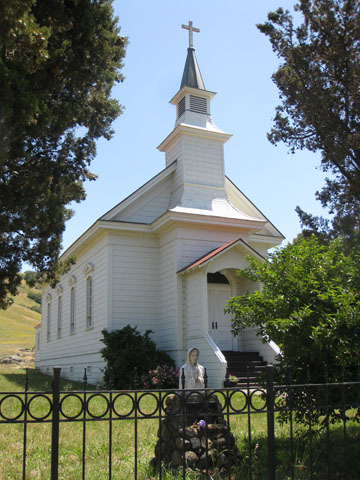 St. Mary's Church in Nicasio is a popular site for weddings, artists, and cyclists. More photos to be posted. Please check back later.